2015 is another successful year for AIST courses on Tolkien. 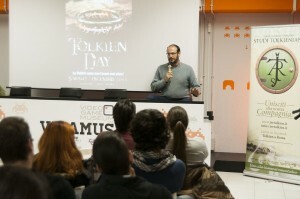 After the first course in 2014, dedicated to his life and works, the Italian Association for Tolkien Studies (AIST) promoted a new course titled “The Hobbit in Depth”. The course started on January the 11th and continues on until March 29th with a lecture every other week. Each speech is given by some of the most important Tolkien scholars in Italy, all Association members. The first part of the course is an introduction to the book and its characters. After clarifying the relationship of The Hobbit with children’s literature, the lessons delve deeper into unusual aspects of the book: the Dwarves and the female characters. Finally, two lessons will be dedicated to the recent film trilogy and the videogames tie-ins from the book and movie franchise. The lectures are a fantastic opportunity for anyone who wants to deepen their knowledge of Tolkien’s early work. By analysing a variety of texts, the audience will experience different literary and cultural perspectives. Every lesson will also be useful for didactic purposes. For more information on the course you can visit the AIST website at www.jrrtolkien.it (the website is in Italian).